Cruise missels fall on Damascus on Friday. On Friday Donald Trump, teetering on the edge of a collapsing Presidency, ordered the launch of swarms of cruise missiles armed with allegedly smart bombs a three selected targets including one in Damascus that were supposedly associated with Syria’s chemical weapons program. Never mind the Cheeto-in-Charge’s incoherent ramblings announcing the strikes, adults at the Pentagon assured reporters that the strikes were limited, and not the beginning of a larger campaign, active entry into the multiple-sided civil war, or aimed at regime change. 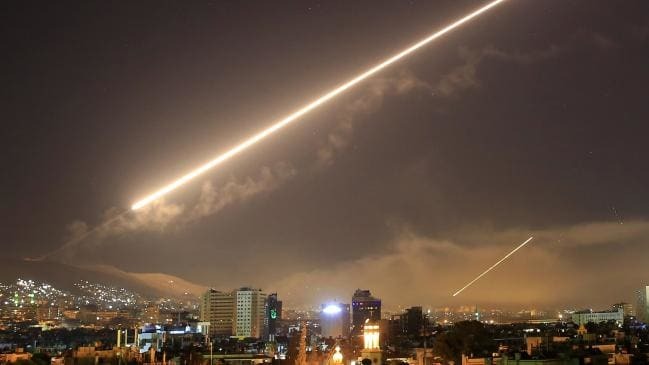 Word was more quietly put out that the action came only after days of quite back channel communications with Syria’s Russian allies in which Western intentions—the attacks included symbolic British and French participation. That means the whole damn thing was largely a charade. The Russians would have plenty of time to relocate any of their official military advisors or supposed civilian contractors, unless they decide to leave a handful of the latter in place as sacrifices to be used as martyred bargaining chips in future negotiations. Likewise the Syrians had time to move sensitive supplies and equipment. The result would be like an earlier showy attack on an airbase after the last use of chemical weapons, where lots of explosives cratered tarmac and sand and collapsed empty hangers. The airbase was fully operational again in weeks. This time in the crowded city most of the casualties would be among the civilians living near by the not-so-perfectly-surgical-s strikes. Now two days later as I write this the retaliation that Vladimir Putin and the Russians threatened before the attack have failed to materialize. Incoming ordinance was not shot out of the air, and no revenge attacks have been launched on “the sources of the attacks,” presumably American and Allied ships and land bases of aircraft. That direct attack on American forces would ignite a full scale war that could easily escalate to a nuclear exchange. For now, everyone seems to have stepped back and be content with a bloody mummery. All of this assumes no massive miscalculation by somebody. The situation remains so fraught with danger that any foolhardy move or even an accident could lead to cataclysmic consequences. In such a situation the fact that one key player, Donald Trump, is erratic, impulsive, and may be seeking a war to prevent impeachment and possible criminal prosecution, leaves the world on edge.Allies, finally seems to be winning the Civil war. The Islamic State (ISIS or ISIL) has been crushed and all but driven from the country. It was targeted not only by the Assad regime but by rebel groups sponsored or supported by the Russians and the West as well as Kurds who remain in possession of most of the North. To complicate matters, the Saudis have backed Al Qaida related Sunni rebels to fight ISIS, the Assad Regime, and it Iranian and Shi’a allies. U.S. and Russian backed rebels have clashed and the Russians have given material and military support to Assad in bloody assaults of the civilian bastions of “our rebels.” Meanwhile Turkey has invaded Kurdish held areas near its borders and has attacked Russian, Syrian government, and American allied Kurds indiscriminately. Millions of Syrians have been dislocated by the civil war and are living as refugees either within the country or in crowded camps in Jordan and Lebanon. Many have tried to find safety in Europe along with Iraqi refugees and Kurds creating the refugee crisis that has rocked governments in both Eastern and Western Europe and helped fuel nationalist neo-fascist backlash. The scope of the still unfolding human tragedy is vast and almost incomprehensible. Syrians both in exile as refugees and in the country have turned for comfort and as a means of expression to their rich tradition of poetry. Schoolchildren recite epics, pop stars set poetry to music, and literary parlor games can go on for hours in the culture said poet and translator Ghada Alatrash back in 2013 when the Syrian Uprising against Assad was already two and a half years old. “The wall of fear has fallen, and people are saying things that they never would have said before.” Before poets would leaned heavily on metaphor and allegory, but both inside and outside Syria have begun speaking out about the conditions they see, using vivid imagery and strong words. Poet and translator Ghada Alatrash shares the work of Syrian poets in Canada. Alatrash now lives in exile in Canada where she collects, translates, and performs the work of those daring poets . Here is one example. with a woman’s patience in adversity. and carries on shepherding life’s rituals. stick by stick from the frigid wilderness. and does not yield midway. they hit with an electric stick on his only kidney until he urinated blood. Yet he returned and walked in the next demonstration. butterflies and skies seen only by his eyes. trees that have sworn to blossom in March or April. that was not affected by a proximate desolation. has not yet been spilled on the surface of our sacred soil. envisioned by the eyes of the poor. and I am Alawite, Sunni, and Circassian. and my Syria is my only religion. Will they erase tears shed on this soil? but today, I am dying from hunger and thirst.